Right now I am more or less desperately trying to make ends meet for my upcoming trip on the last week in August. Top priorities are the making of a new, superultralight cuben tent and a personal flotation device using my water bottles. 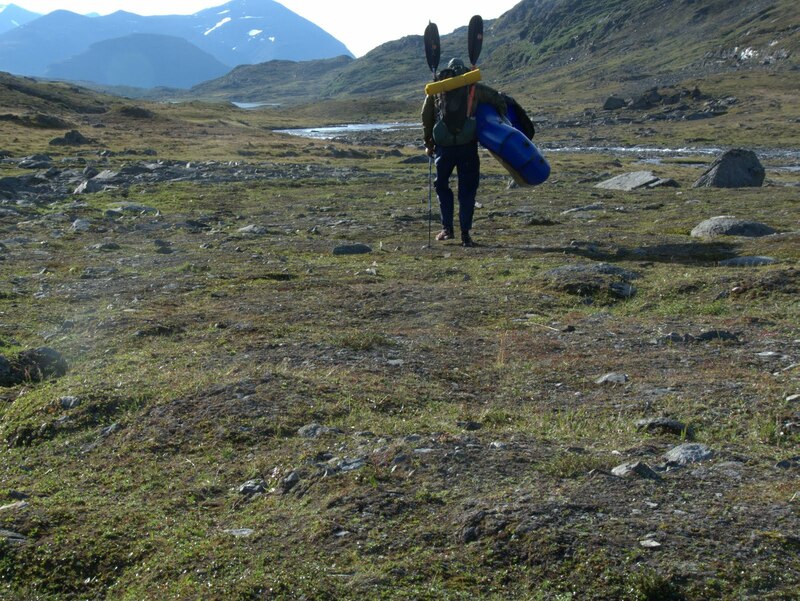 As I hinted in an earlier posting I am taking my packraft into what is probably the most inaccessible part of the Swedish mountains: I am going west of Virihaure. The photo above is from an unforgettable backpacking trip when I was only seventeen and for the first time looked out over what has often been called "the most beautiful lake in Sweden". Virihaure is a big lake in the Laponia Heritage area, Padjelanta NP, close to the border of Norway. The sami summer camp at Staloluokta is seen in the photo and on the eastern shore of Virihaure there are trails and cabins. On the western shore there is nothing, and very often, no one. The reason for the inaccessability is that Virihaure is part of a chain of some other big lakes and also guarded by some pretty ferocious rivers that have taken the lives of sevaral forders, even among the reindeer keepers in the area. So few people visit west of Virihaure and those that do usually come from Norway or let themselves be ferried over the lake by the Sami. I have never been west of Virihaure but it struck me about a month ago that thanks to the packraft this area now would be open to a free ranging exploration of the kind that I like. Wow, sounds fantastic. Virihaure is the most beautiful lake i've ever seen, the coral blue water and the snowcovered peaks of the norweigan mountains on the other side...Looking forward to reading about it when you come back. On a personal note, trekked from abisko to nikkaluokta in sneakers this summer, and climbed the Kebnekaise. Will never buy another pair of hiking boots, and my nineyearold daughter was very jealous, and wants a pair of mesh sneakers for next year. Yes, I am really looking forward to this trip. And I am really happy about your daughter and the mesh shoes. I hiked for a couple of days with my 11-year old son recently and have found that even if kids initially do not like to get their feet wet, once it has happened it is no big deal. After being recently introduced to packrafting by Hendriks blog entry, I decided to buy a packraft myself. I had a vision of how I would use it, and that vision was to go west of Virihaure as I have wanted to get there since I first visited Sarek some five years ago. What a coincidence! Yeah, I think I wrote in some of my articles on packrafting (you can search the blog)that one interesting thing with packrafting is that you can do hikes from a new perspective even in country you know well.You are sort of liberated from watery restraints. The Virihaure area is typical of an area with watery restraints, so I am not really surprised that other people get the same idea when you enter a packraft into the equation. Looking forward to hearing about it when you get back as I've always been a kayaker. Developing my whitewater skills these days but sea kayaking in Abel Tasman, NZ is what started it all. Packrafting & open canoeing is something that truly enthrals me so really fancy doing some in the spring/summer next year. Jörgen, this sounds like a wonderful trip, I cannot wait till I get the chance to visit northern sweden again. I also want to know more about the new shelter. Where did you get the cuben from and what colour is it? Just got back, and yes it was a wonderful trip. The last couple of half days I walked the Nordkalotten trail at the end/beginning and ending up in Sulitelma. Truly a wonderful area that I think you should look into. I'll do some write ups on the trip ASAP, but the Cuben was bought at www.extremtextil.de and I also used their tape. Seemed to work very well. But more on that later. Unfortuntately they were 40 cm short of the amount of olive green Cuben that I really wanted, so I bought the ordinary translucent.